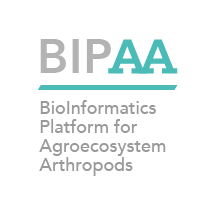 BIPAA is a central platform to assist genomics and post-genomics programs developed on insects associated to agroecosystem, for the Plant Health and Environment Division of INRA. We provide online access to genomic data for multiple arthropod species. We also aim to settle an environment allowing a large community to elaborate complex genomics analyses, browsing, mixing or crossing heterogeneous data. We shares resources and use standards guaranteeing data integration and interoperability, and we improve the coherence of the protocols set up by its various partners. BIPAA works with different INRA labs, and is mainly associated with national networks settled on aphids, lepidopteran and their associated parasitoids and predators. It is also involved in international projects on insect genome sequencing such as i5K. The platform aims at developing particular treatments on a large panel of “omics” (e.g. genomics, transcriptomics, epigenomics, methylomics or proteogenomics) in strong collaboration with the GenScale team headed by Dominique Lavenier, and Dyliss team headed by Anne Siegel, both in INRIA/Irisa center in Rennes, France. The team is part of the Genouest platform, an IBISA platform, member of IFB (French institute of bioinformatics) headed by Olivier Collin at INRIA/Irisa center in Rennes. Collaborative programs with BIPAA are driven by the two French networks BAPOA and ADALEP. Access to some of these resources is restricted. To create an account, use the BIPAA registration form.